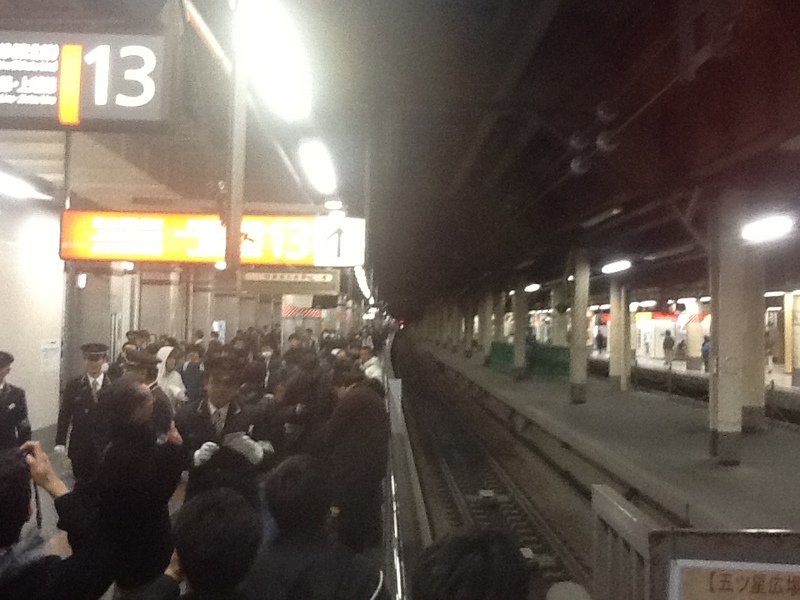 I went trainspotting in Tokyo in March 2014. I got off my train at Ueno Station, took the escalator down from the platform, headed for the main hall in search for an exit. I was on my way to meet some Japanese friends of mine. I noticed the main hall was a lot more crowded than usual. 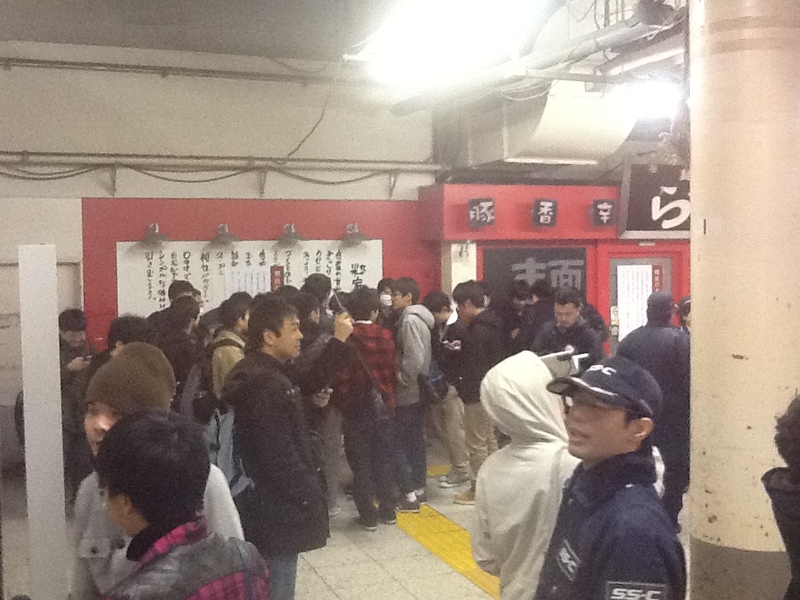 There is always a lot of people in Tokyo, everywhere, all the time, but now there was even more people than usual in Ueno Station. There were even a few TV-crews there as well, and everybody was heading toward a specific platform. Not sure what was going on, but certain it was something I could not miss, I followed the crowd. I tried asking people around me what was going on, but could not find anyone who spoke good enough English to explain. At the entrance to the platform we all were heading for, where everyone was taking pictures of the platform sign, hung a big poster, apparently notifying of something, most likely what the big event was. It was all in Japanese, all I could do was take some pictures of it and get someone to translate it later. 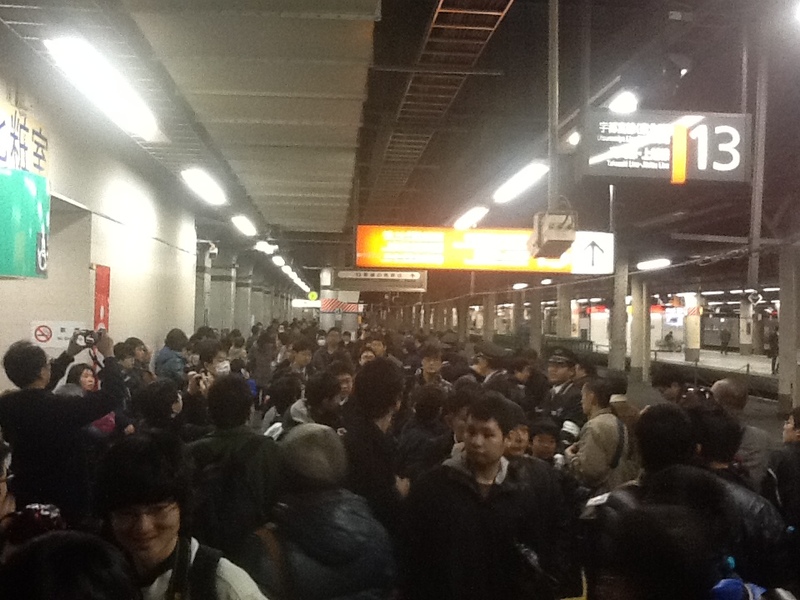 The platform was by now packed with people. Hundreds of Japanese, everyone with their cameraes out. I took a few more pictures myself, not wanting to miss anything, but at the same time clueless as to what was going on. Eventually I got bored, and went to see my friends. 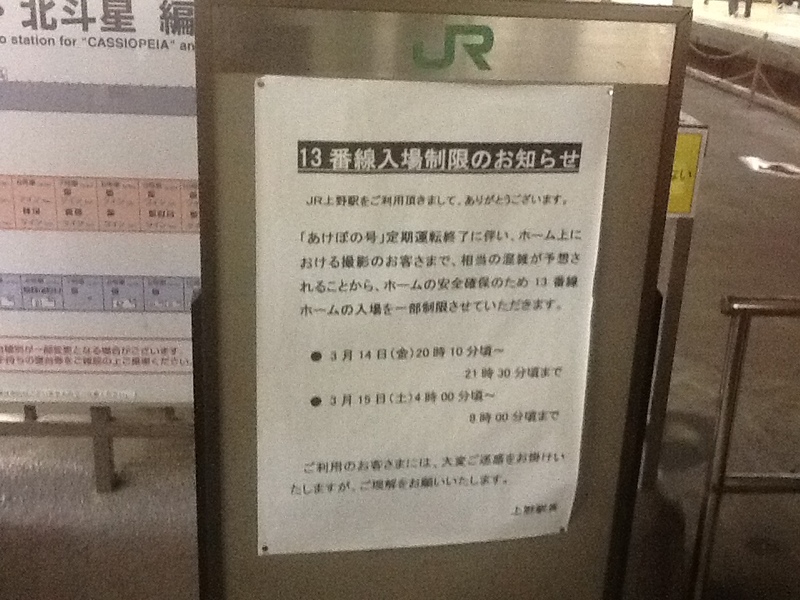 Japan could not function without its train system. With over 100 rail companies and over 27000 km of rails, it carries over 22 billion passengers annually. Almost all rail companies in Japan are privately owned. Following the Second World War, the government encouraged private investments in the railway system in order to rebuild the country quickly. Rail companies were able to diversify into real estate, and develop the land around their stations as well as the rails between stations. As a result, Japanese train stations aren’t just stations. They are giant shopping malls. This, as well as the tendency of Japanese people to clump together in cities and metropolises, has made rail companies in Japan profitable, in contrast to in most other countries. Of the fifty busiest train stations in the world, 46 are Japanese, with Shinjuku Station in Tokyo ranked as the world’s most busiest train station. 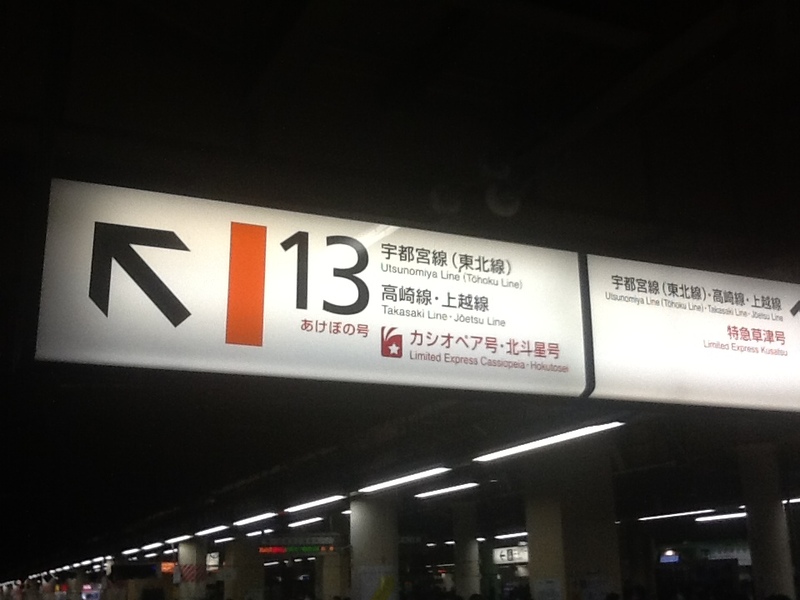 Shinjuku Station is used by over 3,5 million people daily, has 36 platforms and over 200 exits. It took me a while to get an explanation as to what was really going on. I showed the pictures to my Japanese friends, they only laughed, and refused to say what all the fuzz was about. I finally got an American who spoke some Japanese to translate the sign for me. It was the last day of service of that particular train line, and Tokyo’s many trainspotters had turned up to witness that special moment and forever capture it on camera. Trainspotting is a big thing in Japan, with an estimated one million people declaring themselves tetsu-ota (rail fans). Two separate group of rail fans can be identified; noritetsu, people who like to ride trains, and toritetsu, people who like to take pictures of and record the sound of trains. With its over hundred different rail companies, many of them coming with new train models on a regular basis, the Japanese rail system is perfect for trainspotters. There is always an old model being retired or a new train being put into service. Hotels close to train stations have begun to capitalise on this love of trains. Where hotels in other countries might offer rooms with ocean views, in Japan it is now possible to book hotel rooms with a train view. Trainspotters are then able to sit in their hotel rooms, with a view of the station, to pursue their hobby. Another story about trains in Japan: Shinkansen. This entry was posted in Japan and tagged public transport, tokyo, trains on April 22, 2015 by Traveltorgeir. Many years ago, a friend of ours here in the United States was obsessed with trains. We’ve lost touch with him, but I wouldn’t be surprised to find out that he had visited Japan and done some trainspotting of his own.